What Is “Swimmer’s Ear,” and Should It Be Checked? Apple Valley Medical Center Blog What Is “Swimmer’s Ear,” and Should It Be Checked? Summer and water go together in Minnesota, but “swimmer’s ear” is no fun. Both children and adults are vulnerable to this condition, also known as otitis externa, which differs from the more common middle ear infection many children get. Swimmer’s ear can occur with heavy sweating, prolonged humid weather or contaminated water that stays in your ear after swimming. The result is an infection in the outer ear canal. Early symptoms include itching and redness in your ear and possibly drainage of clear fluids. 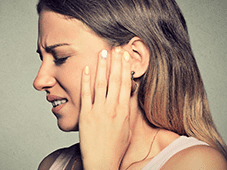 The pain can be worsened by pulling on your ear. If you suspect either you or your child has developed “swimmer’s ear,” please contact ENT Specialty Care at http://www.entsc.com. Physicians see patients right here at the Apple Valley Medical Center.